Wow, with Watkins it just gets better! We continue to find more new Associates and more New customers, and see more people benefiting from Watkins. Earning incomes, finding Watkins Products that help with health issues, fewer allergies and sensitivities, and simply enjoying Watkins Products in their homes and businesses! We’ve added three new Associates to our Watkins Associates Team in the past two weeks! One, a couple, Eric and Karen Winsor, from Port Hawkesbury, Cape Breton, Nova Scotia, whose Family knows and likes Watkins Products! 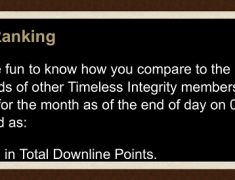 Thus getting the Watkins Associate Membership for $39.95 just makes sense. Eric is also looking forward to selling Watkins Products, while Karen already “Loves Watkins Products” She will be learning, and experiencing, even more Watkins Products. Eric and Karen invite you to contact them for all your Watkins Products needs in the Port Hawkesbury, Cape Breton, Nova Scotia. To order now, phone 902-625-2777. Another couple, Dianne and Noel Lalonde, are already well know in Bear River, Nova Scotia area where they own and operate their own bricks and mortar business Myrtle & Rosies Ice Cream Parlour. Myrtle & Rosies, named after Dianne’s Grand Mothers provides not only Ice Cream, but unique Gifts and Novelties, and delicious home made, ready to serve, meals. Dianne is well know for Her great cooking abilities! No wonder Dianne, who has been using Watkins for sometime now, has become an Associate, to both receive Her 25% discount, and sell Watkins Products and earn up to 39% recommending Watkins quality products to Her customers! To order Watkins Products from Dianne, or to learn more about Myrtle & Rosies Ice Cream Parlour, phone 902-467-0176. The third of our new Associates is a Group! As we’re discovering Watkins Fund Raising Program is an exceptional program for Non-Profits! So, we’re very pleased to have the Ladies Auxiliary of Branch 20 Royal Canadian Legion in Digby, Nova Scotia, as part of our Team. This Group of amazing Ladies headed out the door with Catalogs in Hand to let everyone know that when you buy from them you’ll be supporting their efforts and the wonderful work they do as part of the Digby Legion. They invite you to contact them, or order online, or Toll Free at 1-800-WATKINS! (If ordering Toll Free, to help support the Ladies Auxiliary, be sure to tell the person Taking your Watkins Products Order, that you want to support the Ladies Auxiliary of Branch 20 Royal Canadian Legion and give the person taking your order the Groups ID#393059. For more information, or to order directly from the Ladies, phone Gerri Oickle at 902-467-3671. Do we have a Watkins Associate in Your Area? 3. or, if You’d like to receive your own 25% Discount, and earn up to 39% for You, or Your Group, Join Us As An Associate, or As A Non-Profit Group. Still have questions, or concerns? Contact Brian Hurlburt, Independent Watkins Manager, ID#342198, using our “Ring Me” or “Contact Us” Buttons. Or phone Toll Free 1-877-822-8463. This entry was posted in Our Associates, Our Experiences, Uncategorized and tagged Associate Membership, Bear River, Bricks And Mortar, Cape Breton Nova, Cape Breton Nova Scotia, Digby Nova Scotia, Grand Mothers, Hawkesbury, Health Issues, Home Meals, Lalonde, Mortar Business, Nova Scotia Area, Port Hawkesbury, Rosies, Royal Canadian Legion, Unique Gifts, Watkins Associates, watkins products, Watkins Quality Products, Winsor. Bookmark the permalink.